Encrypted data for maximum security. Unlike self-service backups, which can be accessed via web browser by the user, assisted offsite access grants you the ease of mind that your data is in a safe location as well as the ability to have others pinpoint the data you need and have it delivered to you. On the matter of safety, a pivotal feature of any remote backup service is its encrypted data system. When data is encrypted, the information is put into a special code through a cipher, a mathematical algorithm, which can only be accessed by the holder of the key. In this case it would be you. Even a chemically altered, highly intelligent ape might have trouble with getting at your data through this. Finally, any reliable managed service provider that offers remote data archiving will leave you assured that they have a watchful eye upon your data. Good providers of any kind of remote data backup system will monitor it daily and will inform you of any problems or failures that may occur. This is important because there are many potential failure points in remote backups, including network, server, or software failures that could get in the way of a secure backup. Through a wave of redundancies and other security techniques, remote archiving and data recovery has remained an essential part to any secure business. It has been the contingency plan for thousands of businesses across the globe. 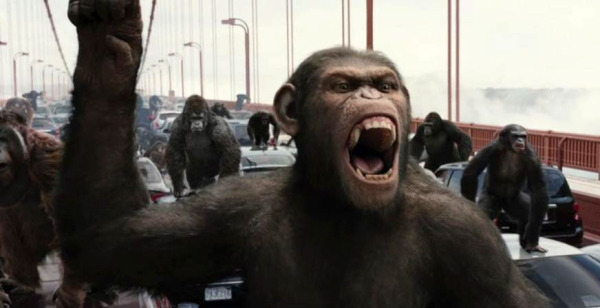 The apes are rustling in the trees, ready to strike; so what’s your plan to be ready for them? Remote Archiving and Data Recovery services are essential for businesses to survive through disasters. Businesses lose 501 hours to downtime due to disaster from an absent remote backup service. Encryption only allows for the holder of the key to access the data. Daily monitoring identifies failure points in the network, server, or software.